What follows are observations based on an important premise. Interesting pinot noir is not cheap – I will be talking about wines for the most part that cost more than $30 in Canada or other markets outside of New Zealand. At this level pinot noir’s fascination is in the way its expresses its place of origin. And those who are going to spend more than $30 are interested. They want to know where the wine comes from, and they will pay for that individuality. They want to taste it and discuss it. So I am talking about NZ pinot noir as one of the world’s most engaging wines, not a commercial commodity. New Zealand’s regulators are slow to address this issue. They are not yet properly identifying regions on the labels. Some argue that it is early days for New Zealand pinot noir; that sub-regionalization is a work in progress, that vineyards need to mature, that winemakers need more time to experiment in and define terroirs; that consumers are not ready to digest sub-regions; that New Zealand needs to present a simple, unified and easily understood face to the world. There are certainly logical arguments in all this, from a marketing perspective. This discussion is not about marketing. In the glass New Zealand pinot is already speaking in sub-regional dialects and its winemakers are too; indeed the whole theme of the NZ Pinot 2013 conference in Wellington was regionality. And as a pinot keener parachuting into the country to get to the bottom of NZ pinot noir it was abundantly evident that pinot noir is every bit as capable of expressing the details of terroir in NZ as it is in Burgundy, which has built its entire reputation on precisely the same foundation. Some Kiwis seem to almost fear the Burgundy association. During the presentations at the Pinot Noir conference Burgundy became the “B word”, barely speakable. They argued their style is different, with which I agree – altho’ NZ pinot style is closer to Burgundy in fact that some other pinot regions. But style has nothing to do with my point; I’m talking about distinctions based on terroir. And instead of shunning Burgundy associations New Zealand should be embracing and emulating what Burgundy has accomplished in terms of putting terroir in the glass. Some might argue that New Zealanders don’t want to play into the Burgundy snob factor. They want to be more populist and definitely more casual about it all. Yet they are busily building a distinct kiwi, barefoot and cut-off shorts pinot culture of their own. It’s the way of the world, as natural as terroir itself and they need to get used to the fact they can be, and are, special. No time for modesty and self-deprecation! In 2013 New Zealand had 5,125 hectares of pinot noir (up 300ha over 2012), placing it in 4th in the world – after France, the USA and Germany. It is the largest production red wine in NZ, and second largest overall after sauvignon blanc. It represents only 9% of NZ’s production and 6% of its exports, but it is rapidly gaining traction outside of New Zealand. In the past five years pinot exports have increased 129%, and Canada remains a strong market – 4th after Australia, the UK and the USA. The generalized view of NZ pinot noir is that is a fruitier, softer, jammier, higher alcohol and more approachable style than Burgundy, but lighter and leaner than California or perhaps even Oregon pinot. I would agree with this, but that style is more prevalent at lower price points where wines are expected to be drunk young. Many NZ pinot winemakers are actually not fans of jammy, hottish pinots, and blame the local wine shows and writers for promoting that style earlier on. At the closing tasting at the Pinot Conference 2013 in Wellington – a tasting of wines considered to epitomize the top quality from each region – virtually are the wines were leaner, well structured, more savoury and age-worthy wines that were very high quality but rather brittle in their youth, despite considerable aeration in proper pinot glassware. They were quite Burgundian. That particular tasting lined up two wines from each of the “established” pinot regions – the regional names that you will see on labels. And there were indeed different nuances of fruit expression (from currants to black cherry) and texture (from lean to rich). So let’s make these regions the starting point of the terroir exploration, arranged in geographic position from north to south. Within each I will discuss sub-regional differences that I encountered based largely on varying soil structures. It may be odd to be opening a discussion of pinot noir with a region that is far better known for merlot, cabernet sauvignon and syrah. Indeed Hawke’s Bay is a warmish and rather humid coastal area to be growing rot-prone pinot, but there are some successful vineyards farther inland on terraces and south of the Heretaunga Plains in bordering hills where limestone and sandstone can be found. 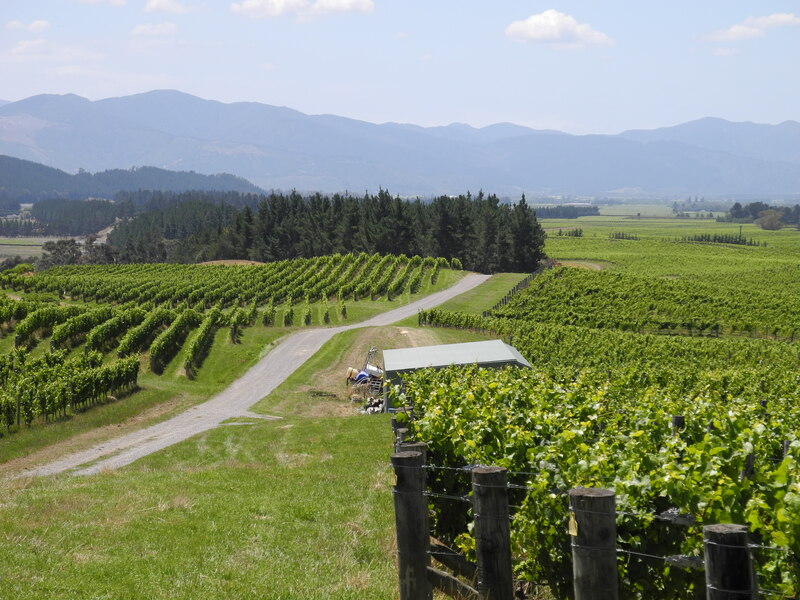 Lime Rock Vineyard has had notable success with its pinot on a 10ha, north-facing site in the Waipawa district. Sileni, Trinity Hill, Greyrock (Flying Sheep) and Osawa are all producing good pinot. From limited personal experience I expect Hawke’s Bay pinots to be fairly deeply coloured and soft with ripe raspberry fruit. Next trip I hope to look more closely at Hawke’s Bay. Don’t count it out. The Wairarapa Valley is large, long pastoral valley up and over the Tararua Ranges about 90 minute drive from Wellington at the southern tip of the North Island. It was one of the first regions to plant pinot noir back in the early 80s, so some vineyards in the core sub-region of Martinborough are now passing their 20 year mark. It is a region of small wineries, none larger than 100,000 cases, most well below 10,000 cases. Wairarapa is something of an unfortunate name in terms of marketability. It’s difficult to pronounce and similar to the Waipara Valley, another wine region on the South Island, of which more in a moment. For this reason it’s natural for most to refer to it as Martinborough, the name of a small town that centres the most well-established, and greatest number of wineries. But there is more to Wairarapa than Martinborough. The climate of Wairarapa is relatively even, warm and dry in the rain shadow of the Tararua range on the west, and lower hills that screen maritime influence on the east. The lower end of the Wairarapa is a bit cooler as it is closer to the coast and influenced by a large lake that pools the waters of the Huangarua River. The soils of Wairarapa’s pinot vineyards are largely stony terraces over which the river once flowed. In some places the stones are very large, densely strewn about and running several metres deep. The notion of sub-regions in Wairarapa is tenuous. But no one disagrees that Martinborough is the central region. The wineries are tightly clustered around the town on flat, but very stony soils. It’s wines are ripe with black cherry, quite thick, lush and silky textured, and often showed notable alcohol heat. Many also carried a savoury note and dusty character on the finish. Many wineries show this style: Ata Rangi, Te Kairanga, Shubert, Magrain, Vynnfields, Archer McCrae, Alxander, Alana, Brodie, Elder and Escarpment – many of them dotted along Nelson and Huangarua Roads on the edge of town. The locals are starting to distinguish wines from newer plantings on very densely-gravelled Te Muna Road that lies about 5km from Martinborough. This includes a huge new planting by Craggy Range below an embankment on the river’s edge. And I did taste a leaner more vibrant, style in a couple of single vineyard samples with fruit more in the blackcurrant spectrum from Julicher, Kusuda, Craggy Range Te Muna and Big Sky. Dry River Terraces which lies west of Te Muna and marginally closer to the coast might also be considered a separate region, but production is virtually limited to one winery called Dry River, a pioneering winery with a reputation and price rising well above all others in Wairarapa indeed amongst the most expensive in New Zealand. Nearby are the relatively large holdings of Murdoch James. Their 32 acre site is on limestone based hillside (the only significant sloping and limestone driven site in the region) from which they bottle another vibrant currant pinot called Blue Rock. It too might one day be a sub-app. This is a smaller region about 30 kilometres up the valley and farther inland from Martinborough, where the climate may be slightly warmer. 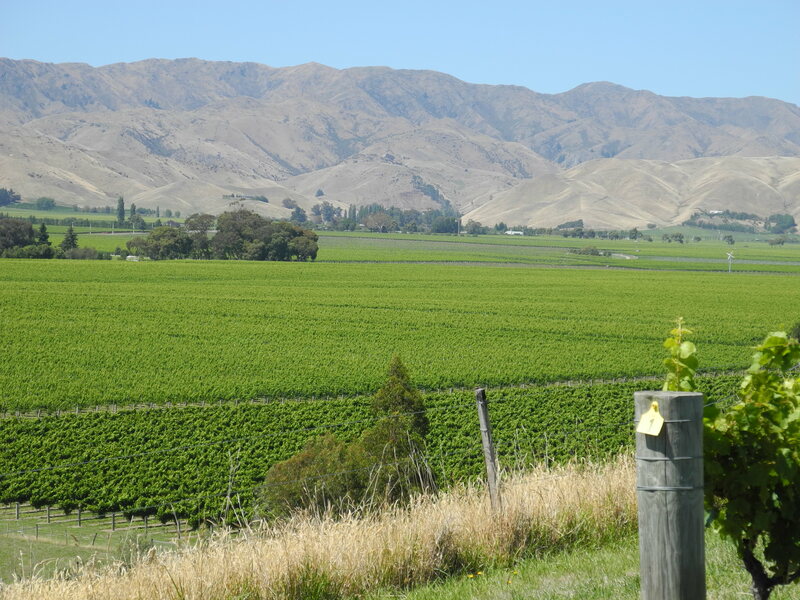 Gladstone Vineyards, first planted in 1986, anchors a cluster of small wineries on stony terraces at the edge of the Ruamahanga River; with neighbouring Borthwick having major acreage as well. (Nova Scotia born, Brock University educated Alexis Moore took over winemaking in 2013 at Gladstone Vineyards). From a small sampling I found the pinots somewhat paler in colour, with good weight and strawberry/cherry fruit character – not as dense and powerful somehow as those of Martinborough. Masterton is yet another nearby sub-region that will one day seek its own appellation. At the 2013 Pinot conference I was most surprised by the quality of the pinot coming out of Marlborough, over any other region. The surprise had something to do with preconceptions. I had always had an elevated view of Martinborough (above) as one of the original, pioneering regions, and likewise a high expectation of Otago as being the colourful wild west region. Marlborough was supposed to be the commercial pinot centre with big companies trotting out friendly, simple, raspberry-scented pinots. But the real story delves much deeper, beginning with the fact that Marlborough has a cool-moderate climate latitude at 41.8 degrees – warmer than Burgundy or Ontario, but cooler than California. Add in coastal influence and it is cool climate indeed, although blessed with generous doses of intense sunlight from a “hole in the clouds” that seems to reside over the region. A sweet spot indeed – but then even within Marlborough there is considerable climatic and soil diversity. I have only listed three sub-regions for now, but there could easily be another five to ten claimed in the years ahead. And a reminder here that many larger volume pinots could be and are blended from more than one sub-region. The Wairau Valley forms the heartland of Marlborough, narrow upstream where hills pinch in on the Wairau River, then it broadens into a wider river plain as it finds its outlet into Cloudy Bay. The river course sits tight against the Richmond Ranges on the north and can be susceptible to more rain. But the soils here are very stony, and there are excellent vineyards sites along Rapaura Road. In an area called the Golden Mile there are also old riverbed terraces. Some sites are thick with often very large stones that radiate heat into the vines. Both Golden Mile and Rapaura Road could easily be claimed as appellations in their own right. Out towards Cloudy Bay the soils get sandier and lighter, and in the other direction up river, some sites are creeping up into the hillsides, so again more fodder for future appellations. There are almost too many wineries to mention in this area but those making some higher end pinots from Wairau fruit and more familiar in Canada would include (listed from west up the valley eastward down to the coast) Clos Henri, Oyster Bay, Seresin, Forrest, Nautilis, Geisen, Staete Landt, White Haven, Stoneleigh, Cloudy Bay, Hunters and St.Clair. On the south side of the Wairau Valley the flat lands poke like fingers into the Wither Hills in a series of five valleys: Ben Morven, Brancott, Omaka, Fairhall and Waihopai. Cold air descends from the Wither Hills into these valleys creating a cooler, later ripening climate than on the northern side of the Wairu plain, so the pinots tend to be a bit leaner. Each of the valleys could one day be named as individual appellation, based largely on micro-climate and distance from Cloudy Bay on the Cook Strait. In general the soils are quite similar with significant stone content but they also have higher levels of clay than the other sub-regions. 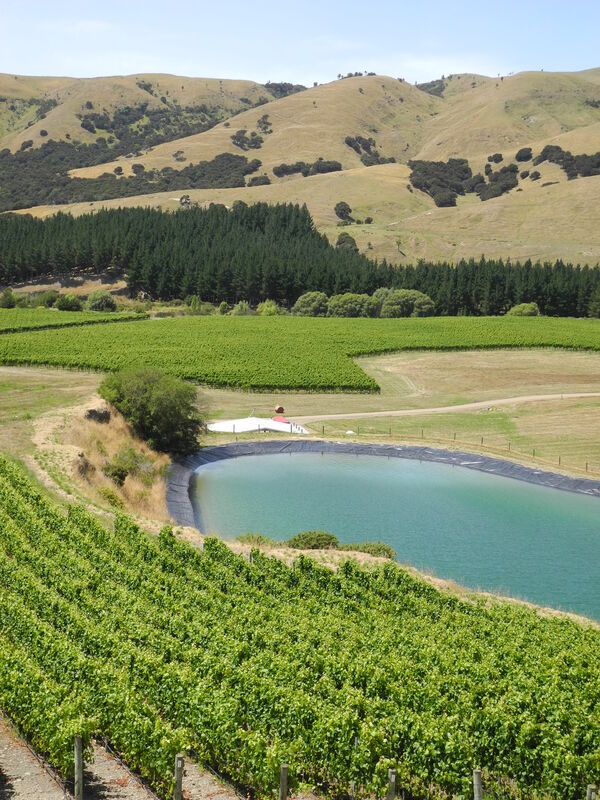 And then of course there is a rapid growth of planting into the hills and ridges that separate the valleys, and wineries located thus – like Churton for example – are clearly in the belief that separate Southern Hills appellations make sense, especially those that have limestone outcrops. What I noticed while tasting pinot from the Southern Valleys, is that many are already being labeled with individual valley and vineyard names – St. Clair’s Omaka, Delta’s Hatter Hills, Wither Hills Benmorven, Wither Hills Taylor River, Fromm’s Brancott Valley. Individual appellations cannot be far off. Wineries situated in and using predominantly Southern Valleys fruit include Marisco, Spy Valley, Omaka Springs, Fromm, Dog Point, Brancott, Auntsfield, Wither Hills and Lawsons. 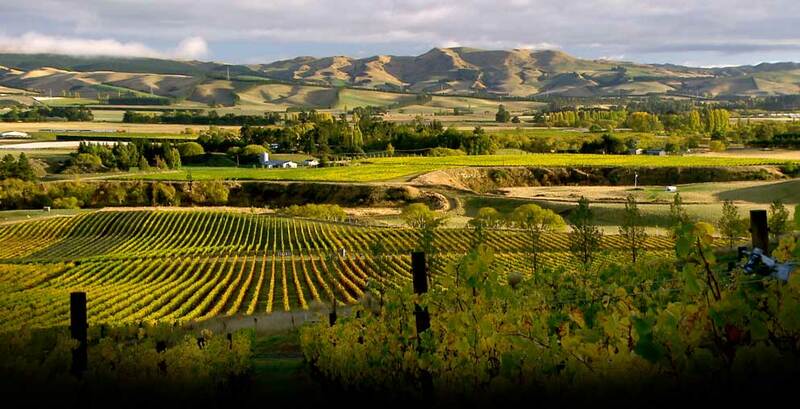 Given the number of larger and more well-known wineries in this list, I think the responsibility to delineate the different potential sub-regions in this diverse area – and to promote sub-apps in NZ as a whole – rests largely on their shoulders of the larger Marlborough producers. Go for it! Of any Marlborough sub-region Awatere is clearly the most deserving, and perhaps closest to achieving distinct appellation status. Southeast of the Wairau, over the Wither Hills and closer to the Pacific coast, the vineyards of the Awatere experience a cooler, drier and windier growing season. The area can be more exposed to occasional cold weather from the south than the other sub-regions, which tends to create a later ripening crop and even longer growing season. The soils are typically alluvial gravel on wind-borne loess, often exhibiting a diverse composition of stone materials. The pinots from Awatere are some of the leanest, greenest and nervy of New Zealand with cranberry-curranty fruit. Many still get blended into “Marlborough” pinots but keep your eyes peeled for pinots from Yealands, Vavasour etc. There are also new plantings even farther down the coast past Awatere. The Nelson region sits atop the South Island one range of mountains to the west of Marlborough, at the same latitude. It is at the head of long sound that runs off of Cook Strait. So it is a moderate to cool region, very well known locally for its orchard fruits and cold water seafood. It is also a thriving arts community with a rapidly evolving culinary scene. In terms of viticulture there are two regions for now the Waimea Plain and Moutere Hills, although some would argue for a third Moutere Coast region at the western edge where the Moutere Hills come down to meet the ocean. This is the largest region of Nelson, the flattest and closest to the town. The flats come off a large tidal basin and extend inland for about ten kilometres, narrowing as they come up against the hills. The Waimea River carves a path through the region but is not big enough to have much climatic influence. The plain is cooler and sandier closer to the ocean. Pinot Noir is grown here but sauvignon blanc, riesling are more important. The pinots tend to lighter, floral and quite racy. Important pinot noir wineries in the region include Waimea Estate, TeMania/Richmond Plains, Seifried, Kaimara Estate. This is a scenic area of rolling hills framing the western boundary of the Waimea Plain. The hills run up from the coast, rising in altitude the farther inland they reach. The region is generally cooler than the Waimea plain, but more importantly the soil structure changes to include more rock, including some limestone. The cool climate and limestone combine to create some of the most fragrant and elegant pinots of New Zealand, particularly at Neudorf, which is rising to become one of the iconic small producers of New Zealand. Woollaston, Harakeke Farm, Kina Cliffs, Sea Level and Rimu Grove are other notable producers of pinot. The latter, Rimu Grove, is making great pinots from an unusual site where the hills meet a coastal inlet. Rimu Grove and neighbours near the sea could rightly achieve a Moutere Coastal appellation at some point. Spanning 200 kms along the eastern coast of the South Island Canterbury/Waipara is still in formation as a pinot region, and needs some official and difficult sorting out of names. Canterbury is the best known regional/political name, describing the region around the city of Christchurch where the first winery opened in 1978. But since then there has been a massive shift of viticulture to the Waipara Valley north of the city, and subsequently into the hills on both sides of the valley floor. It makes most sense to me, in terms of appellations to use the three different specific sub-regions below (all within Canterbury). It is a cool climate region and generally dry within the rain shadow of the Southern Alps. Hot northwesterly winds often blow here. But it is also coastal, and it is fairly common for cooler, more humid winds to blow up from Antarctica and change the weather. About 40 kms north of Christchurch, which lies on the edge of flat coastal plain, a cluster of low hills rise directly on the coast. But behind them runs the north-south Waipara Valley, which is increasingly being planted with very large vineyards. There is the gamut of cool climate grape varieties, but aromatic whites like riesling, gewurz and pinot gris are important, as well as pinot noir. The flats of the southern Waipara Valley are largely sandy and alluvial with gravel patches from current and former river bed soils and terraces. Pegasus Bay and Torlesse are the pioneering spirits, but Bellbird Springs is achieving international star status as well. And Mud House has recently opened at large winery here. The Waipara Valley is framed by hills on three sides, and pinot viticulture in particular is moving into these areas. To the north the valley splays and melts into hills that pinch in from the coast and the interior as the mountains begin to veer east toward the sea. To the west the land rises into foothills leading to the Weka Pass. As with all hill areas there are varying aspects, elevations and soil strata. And so the pinot terrain becomes quite complex with limestone derived clay, stone and even some areas of limestone outcrop, particularly inland in the Waikari region pioneered by the highly regarded Pyramid Valley and Bell Hill. And the limestone soiled Omihi Hills region could angling for sub-appellation as well. There are a surprising number wineries here, most quite small. Crater Rim, Muddy Water, Mt Beautiful, Alan McCorkingdale, Bishop’s Head, Dancing Water and Mountford are all producing interesting pinots with structure and depth. The flat Canterbury Plains surrounding Christchurch may have given birth to wine in the region, but is arguably becoming less important as a wine region as development takes strong hold in Waipara. It has a slightly cooler climate than Waipara due to direct exposure to the sea. The plains are comprised of mainly of shallow free-draining stony soils with varying alluvial deposits thanks to a large number of creeks and rivers crossing the plain now, and in former eras. West Melton, Banks Peninsula and Rolleston are all sub districts of this area, where white wines are much more prevalent than pinot. I have had not had enough pinot grown here to establish a wine style but I have sense a lighter touch, more foresty touch. Inland and south of Christchurch the west-east oriented Waitaki Valley is generating considerable pinot excitement and rapid expansion. Climatically it is more like Otago than Canterbury, but falls geographically and administratively on the edge of the Canterbury line. It is farther south thus cooler but being farther inland (60 kms from the ocean) it experiences less humidity, warm summers and typically, long dry autumns. The main draw here however is the limestone-ridden/schist soils on the hills above the valley floor. The vineyards are planted on north-facing (sun-facing) slopes along the south bank of the river near the town of Kurow. I have been very taken with the fragrance, energy, depth and minerality of the few Waitaki pinots I have tried, including Ostler’s great Caroline Pinot. Other wineries to watch include Valli, Q Wine and Otiake. A star is emerging, very much worthy of its own appellation/regional status. It isn’t Otago and it isn’t Canterbury, so let it be its own very special pinot haven. Central Otago burst onto the NZ and international pinot scene through the 2000s; with wines and attitudes as brash and bold as the landscape – a magnificent mix of mesas/terraces, rivers and reservoirs back-dropped by snow-capped mountains. On my first trip to New Zealand in the mid 1990s I was asked if I would be interested in tasting pinot noir from a man named Alan Brady who had pioneered a winery called Gibbston Valley way down on the South Island near Queenstown. He would bring the wines to my B&B in Auckland. Of course I agreed, and I remember being struck by the nerve, energy and fragrance of his wines. As well as by his passion for the future of Central Otago. Today there are almost 100 wineries in Central (as they call it locally), all making pinot noir (plus riveting chardonnay, riesling and pinot gris). Pinot noir is 70% of Otago’s wine production. But as I quickly discovered during my first trip there in 2013, Otago is not one place, indeed there are at least six sub-regions. They are however united by latitude – a frost-prone 45-47 degrees (Niagara is 43.5, Burgundy is 47). It is claimed to be the most southerly wine region in the South Hemisphere. They are also united by fairly high altitude in the arid lee of the Southern Alps (not unlike B.C.s Okanagan Valley at 49 degrees). So it is a cool region indeed, on paper. But the growing season can be hot and sunny indeed. Central Otago is more prone to make ripe-fruited pinots that often have high alcohol but also good acidity thanks to cool night-time temperatures. Long cool and usually dry autumns also allow longer hang time and more flavour development. It is the only continental climate pinot noir region in New Zealand! The soils of Otago are essentially loess and gravel, which means they are quite well drained, even more so as most vineyards are some degree of slope. Shaped by glaciers and now carved by lakes, rivers there are a wide range of soils across the various sub-regions, comprised of schist, clay, silt loams, gravels, windblown sands and loess. The majority have stony sub-soils, with schist or greywacke bedrock. Many Otago wineries have vineyards in more than one sub-region, and may blend regions. So the Central Otago appellation is widespread. Lake Wanaka, with vineyards along its shoreline near the charming town of Wanaka, lies 80km and a couple of mountain ranges north of Queenstown. Rippon’s spectacular vineyard has become an iconic photo-opp for New Zealand wine, thanks to the backdrop of snow-capped peaks. Wanaka is a bit cooler and slightly wetter than other sub-regions, but the lake does reflect heat and helps prevent frosts. Rippon, an excellent biodynamic producer, anchors the small Wanaka region, but Mt Maude and Atiku are making wines of elegance as well. The large “central” valley of Central Otago winegrowing is defined by Lake Dunstan, a man-made 25km long reservoir with the orchard town of Cromwell at its south end. 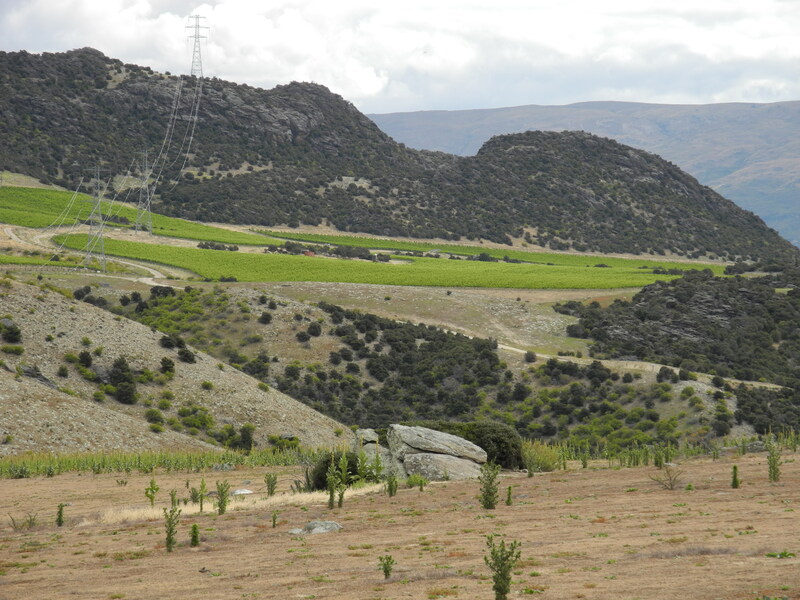 The lower altitude vineyards near Cromwell tend to be defined as coming from the Lowburn, while those from sloping sites and terraces on the lower slopes of the Pisa Range are defined as Pisa. One might argue for two separate appellations here but there is a blurring of sites in my mind at least. It’s a warmer, earlier ripening area on sandier soils and overall I find the wine style to be quite ripe, fruit forward and fragrant with a certain juicy drinkability. Many Otago wineries have acreage here, but of those located in the Cromwell Basin look for Quartz Reef and Surveryor Thomson (both biodynamic), Rockburn, Archangel, Wooing Tree and Aurum. Northeast of Cromwell, on slopes and terraces on the east side of Dunstan Lake, Bendigo is possibly the warmest of all the sub-regions (although Alexandra is too) with vines planted on north facing slopes on stony and wind-blown loess soils. Some are at 220 metres, others higher up at 330 metres. At any rate, it’s rather wild country, with hot days and cool nights. I find the wines quite powerful, broad and chunky with a ripe fruit and garrigue (masculine as opposed to a more feminine style across the way in Pisa/Lowburn). Impressive wineries based on some personal experience are Misha’s Vineyard, Tarras, Mondillo and Prophet’s Rock. Bannockburn is perhaps the most well-established and well known of the Otago sub-regions, thanks to founding of three wineries in the 1990s that went on to carve out a great quality reputation outside of New Zealand – Felton Road, Carrick and Mount Difficulty. The vineyards lie south of Cromwell (and removed from moderating effect of Lake Dunstan) on terraces and hills that have been carved into some breathtaking land forms. The region was once heavily mined for gold. This is a warm, dry region, producing powerful, age-worthy, distinctive and complex pinots, often with a note of wild thyme. Aside from Felton Road, Carrick and Mount Difficulty, look also for pinots from Hawkshead, Bannock Brae, Terra Sancta, Akarua, Georgetown and Wild Earth. The most southerly sub-region of Otago, and perhaps the most southerly pinot region in the world actually had a winery in the 1860s, and the old walls still stand. The Clutha River drains out of the Cromwell Basin and flows south through a gorge into the Alexandra Basin. It is very hot here during the summer but the nights are also very cool. The landscape is scenically average until you come upon some almost lunar-like outcroppings of decomposing schist, around which vineyards are often planted. I found the pinots here to be very ripe, rich and often possessing glorious cherry fruit. Two Paddocks by actor Sam Neal is one of the most well-known Alexandra wineries, although tiny Grasshopper Rock is very much on my radar too. There are several other small wineries as well. And that is a wrap for now. Hopefully this gives NZ pinot fans something of a more cohesive framework that begins to make some sense of what you are experiencing in the glass from New Zealand pinot noir. I urge NZ winemakers to get their regions onto the labels anyway they can to help the consumer cause. And I expect that over the next decade we will see many more appear.